Hey there! How has your organizing been going for you this summer? Not enough time?! That is how I feel. Summer is always different than I expect it to be. Heading into it, I always picture a string of lazy days by the pool, but reality is summer is just as busy as the school year … just a different kind of busy! A number of my personal organizing projects are on hold until my kids are back in school in a few weeks. Non-essentials are getting pushed to the side as we embrace our summer birthday fest (5 out of 6 in my family have birthdays within 6 weeks) and getting ready for school! I am finding a little time to help some clients out this summer, which has inspired me to share some thoughts with you. De-cluttering is an emotional and personal experience. I feel so blessed that my clients let me into their personal space and share openly and honestly about their feelings and struggles. This is how I learn that there is a similarity between how many of us feel about our stuff. If you feel guilt when you get rid of unneeded items in your house, you are not alone. 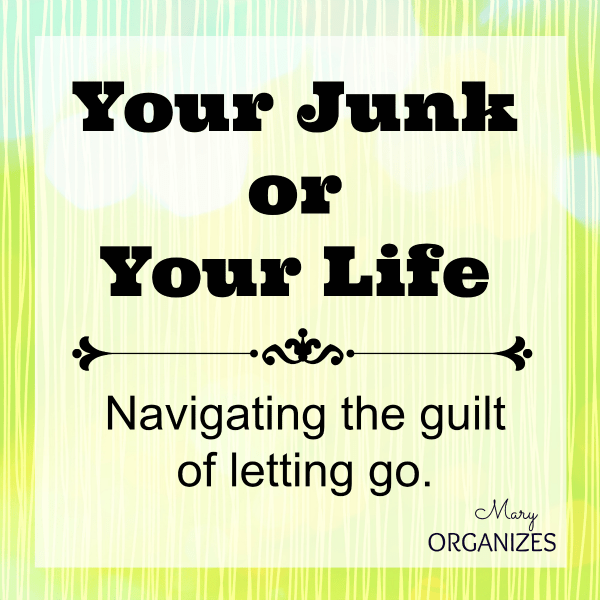 Sometimes we have to make the hard choice between Our Junk or Our Life. The idea of letting things go is something I bring up quite regularly. Here is a little reminder of some of my past posts that relate. These were the ones I could remember, there might be more I’ve written. If you only read one of these, read this top one: Secrets of the Organized. Secrets of the Organized (Secret #1) – All about Purging! And if you are wondering why I never finished that series, it is because I decided to make it an eBook. Still working on it. You will definitely be notified when it is ready!! How To Setup A Donation Station – This one is about one way of controlling how you get the stuff out of the house and making it easier to purge frequently. How To Organize (or 3 Steps to Organize Any Space) – A practical how-to guide for getting a space organized! Quit Your Free Thinking – Pretty much what you’d expect from the title. Too Many Leftover Containers! – Also a little bit about organizing kitchen cabinets. Kids Laundry: Setting Limits & Creating Neat Drawers – I think you need to read this one before you shop for school clothes! What is bought is bought, and keeping it does not get your money back. This is a sunk cost. A sunk cost is never a good reason to sink even more of your time/money/energy/resources trying to get it to “float”. Say adieu and move on. The more objects in our homes, the more we have to take care of and dust. This takes time away from doing more enjoyable things. We pay rent/mortgage for every item in our homes. If you are stressed because of clutter, that is an additional cost. NO ITEM is worth that cost. 99% of our stuff does not get more valuable being stored – it gets old and dirty. If you have to sacrifice that 1% for the sake of a clean, peaceful home, SO BE IT! Keep your eye on the prize. How much would you pay right now to have a clean/organized home? Are you going to let this item get in the way of that?! When objects (not people!) get old, they often become obsolete and lose usefulness to ANYONE. So letting them sit in storage waiting to be used is a big waste, even a huge waste of money! Pass things on while they are in their prime!! The person who needs it will be thankful AND you can be thankful you don’t have a clutter-filled house. And to go along with this – the better you get at tossing stuff you don’t need you AUTOMATICALLY start to get better at NOT BUYING additional stuff you don’t need. In the end, YOU SAVE so much money by decluttering and getting rid of even “valuables”. In no way do I intend to trivialize the difficult emotions of getting rid of stuff. I have a great respect for my clients that struggle with this guilt. It is a great passion of mine to free my clients (and now my readers too!) from this guilt, because in this freedom, you will find the life you want. I really believe that with letting go of stuff, of the material junk holding us down, our quality of life improves drastically. Stop letting the stuff take over your life. If you have to choose between Your JUNK or Your Life – always choose your life. Practical Tips to Get Organized This School Year! Great tips Mary! I will be referring to this! You are not alone. Junk stops so many people from really living. I am so glad you are here and ready to be liberated from your stuff! I have let my stuff…My house get rediculous. Seriously, when I walk in my front door my mood instantly plummets. My husband’s does too. The horrible thing is I’m home ALL DAY!! We have a 2 yo son that I spend the majority of my time with but I could multitask but I don’t know HOW. Now my house is a disaster and every time I look at it I just get overwhelmed and can’t find the motivation to move forward. I’ve threatened a thousand times to just grab a trash bag and throw everything away. Maybe it wouldn’t be so bad to grab some trash bags and do just that. You may have been joking, but getting rid of the clutter will help you!!! Have you seen the Declutter Challenge? There are lots of people in your situation digging themselves out of the clutter! I have seen the book/PDF but we can’t afford at the moment. Thank you for succinctly summarizing why spending money on something doesn’t make it worth keeping! The guilt of waste really resonates with me, and I know I’m thinking wrong, but I like the points you make. This is going to help me move forward. This couldn’t come at a better time in my life. The title of this post REALLY resonates with me at this time in my life. “Your Junk or Your Life”…. My junk is taking time away that we could spending with our daughter. It is literally robbing me of hours & days of my life!!! This post makes me want to get rid of even more!!! This post makes me want to get rid of more stuff when I re-read it too! We all need to be reminded often, because it is so natural to slowly fall back into keeping things. In regards to “I spent money on this, it would be a waste to get rid of it” – I’ve found that seeing that item is a painful reminder of my buying mistake. Once it’s gone, I can forget that I ever spent that money. Very very true, Janet! Great point! Thank you for your kind comment! And I’m always amazed at how much easier it is to avoid bringing in junk when I am de-cluttering! Taking a deep breath! I’m in tears. I don’t say this to make you feel bad for me, it just hits home. I know I need to get through this. My hoarding and clutter has been driving a wedge between my family and me. I’m not the gross, dirty, one pathway through the house kind of hoarder, but I just have a lot of stuff and keep things “just in case”, blah, blah, blah. My desk is a mess with piles of papers everywhere. I tend to come in from errands and toss things on the kitchen counter, table, or desk. I leave things out and forget to come back to them. Pretty sure it’s fate I came across your site. I’m ready! I’m so glad you found this site and you are here at just the right time. Stop beating yourself up for the past and start creating the future you want!! You can do this!! Last year when I first did your challenge, I sold a lot of stuff on our local yard sale page! Then I took more to donate to thrift shop. It was so good! I looked through things that were stored and decided to either find a use for them so they were enjoyed, or display them properly. I did take 2 beautiful crystal candy dishes and filled with treats and gifted one each to my daughters! They loved them and I didn’t have to deal with them anymore! I just keep looking at items and figuring out if I am keeping them and how I will use them, rather than just sitting there taking space. Thanks to you course! My family has jokes about me … they think I’ll declutter anything (and I kind of will). Ha! Thank you for this post. I am moving and have been having trouble getting rid of clutter. This helped me! So glad to help! Good luck with your move.